The first step in treatment is to look at a clean, completely dry hedgehog. Our Bathing Articles describe an oatmeal bath, how to bathe your hedgehog, dead skin removal, and simple skin care tips. Various owners and breeders treat simple dry skin with various over-the-counter remedies and other items usually found around the house. Very rarely will a veterinarian prescribe a prescription treatment for dry skin only, since many other more cost-effective means are successful. In many cases an oatmeal bath will clean and soothe the skin, and no other treatment is necessary. Healing should happen fairly quickly, and if not, a trip to the veterinarian is necessary because dry skin that is not accurately treated will become worse over time. Mite infestations can be the root of the dry skin problem and will continue to cause more skin and quill damage if not properly treated. Most veterinarians recommend a treatment of Revolution as a precautionary against mites because it is more reliable than looking for mites, it is inexpensive and very safe. Another reason to see a veterinarian is the he/she may need to prescribe oral antibiotics such as Trimeth-Sulfa Susp and Conofite spray for fungal problems. Oral antibiotics such as Itraconazole may be necessary as well. Niks Skin Soother was formulated especially for Critter Connection as a natural and safe dry skin treatment for both humans and hedgehogs on the farm. The skin and quills should not appear greasy or oily. Many hedgehog owners have noticed improvement in their hedgehog’s skin using this product. 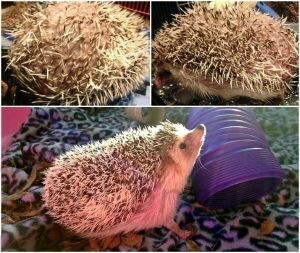 Hedgehog owner: Amber Marcantel Petry “My vet approved me dosing my hogs 2-3 x week 2-3 drops (adjust dose as Poo loosens) My hogs love it on their dry food! When Rielei got sarcoptic mites and red mange, lost almost all his quills…. I dosed him 1 drop per day. My vet told me it could be months before I saw quill growth. She was amazed when we had new quill growth beginning 2 weeks later. He was 3 then. He grew back almost all his quills. Olive oil is a simple home remedy for dry skin associated with bedding dryness and quilling. 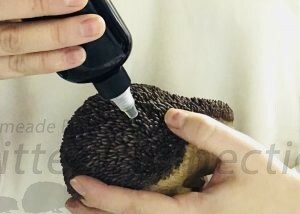 Four to five drops of olive oil can be applied directly on the hedgehog’s skin between the quills to help soothe some of the dryness. Either an eyedropper or a syringe (without the needle) works well to drop the oil directly on the skin. Olive oil treatment can be repeated every 2-3 days as necessary. It is important not to add so much oil that the skin appears oily. Please be cautious when using topical oils and added heat as the heat and oil can cause a minor burn and further irritation. Olive oil is not very absorbent so it coats the skin (which is good for healing) but can be dangerous if your hedgehog is under direct heat. Flax seed oil is not harmful but it can have an orange color when applied topically. It can go rancid if left unrefrigerated. Flax seed oil caplets can be purchased from a local health food store and some drug stores. The convenient capsules can be punctured on one end and a few drops can be squeezed onto your hedgehog’s back. 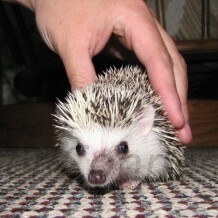 Doing this after a bath will allow the oil to more readily cover the hedgehog’s entire back. Remember not to use too much or you will have a slippery hedgehog! Human Vitamin E Gel caplets can be found in most supermarkets, drug stores or health food stores. The capsule can be punctured on one end making it easy to apply the Vitamin E oil on their hedgehogs back. It is recommended to put on the hedgehogs back, 1 drop behind each ear after a bath to allow the oil to spread across their backs. Vitamin E can be applied without a bath for maintenance as bathing too frequently can increase the dry skin. One must be careful not to give too much vitamin E. It is a fat-soluble vitamin and excess is absorbed into the body instead of excreted. ☠ Do not use a Tea Tree Oil based shampoo or oil as this is EXTREMELY toxic to hedgehogs. (Hedgehog Wiki 5/14/09). This recommendation has been highly circulated in the hedgehog community. Upon further investigation we have found that tea tree oil is often used in treatment of ectoparasites and other skin problems in Europe. Tea tree oil varies in purity and species variety. Use caution when dealing with unknown products. ☠ Because of hedgehogs’ propensity to frequently groom, it is best to avoid grape seed oil altogether, since there is a high risk of your hedgehog ingesting topically applied grape seed oil. Please also see our article Food Additives for Dry Skin.